If your looking to incorporate mobility and injury prevention into your 2018 goals, ELDOA is a great place to start. Developed by French osteopath Guy VOYER (yes, his legal name is in all caps), ELDOA is an acronym from French words, which in English translate to longitudinal osteoarticular decoaptation stretches. “Osteoarticular” means bones and joints, “decoaptation” means opening, and ELDOA is the name of both the method and the postures involved. I took a group ELDOA class with Emily Morgan, a personal trainer and ELDOA student practitioner in Pensacola, FL. 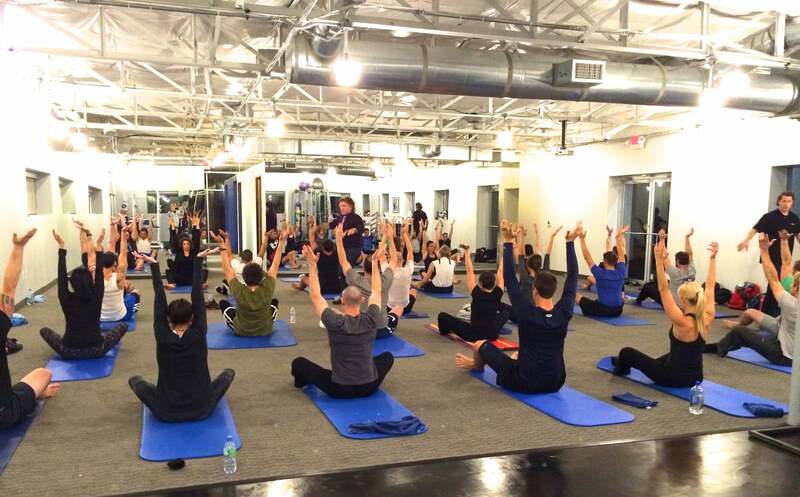 The 45-minute session was a typical ELDOA for wellness class, with a mix of postures each held for 60 seconds. The basic postures were performed sitting, lying down, half-kneeling, or on all fours. The class didn’t feel like cardio or strength training – or really like any workout I’ve done before. The closest thing I can compare it to is yoga, but only because ELDOA involves holding postures; otherwise, the similarities end there. For instance, the ELDOA pictured below isn’t just “stretch your arms over you head.” This posture, called T6-7 or “the desk workers’ ELDOA,” requires you to align your body so that the head, torso, and pelvis are in a straight line. You reach toward the sky and push upwards as hard as you can while pushing your knees toward the floor and gazing at the floor in front of you, never relaxing for the full 60 seconds. It’s harder than it looks! She visited a number of experts, none of whom could diagnose the source of her pain. One doctor diagnosed her with a groin strain; another thought it was a hernia, which led to Morgan having completely unnecessary hernia surgery. “Surgery, MRIs, X-rays, physical therapy, muscle strengthening – nothing helped to keep me from having pain if I played.” After starting ELDOA – specifically, postures to open her spine and hip – she can play soccer again without any pain. ELDOA is an excellent addition to any workout routine, whether you’re dealing with a specific pain or injury or just trying to keep your body healthy. Frankly, it just feels great. However, it’s important to learn from a certified ELDOA trainer. There isn’t much information online, and a lot of what’s out there isn’t accurate. While there isn’t a comprehensive directory of ELDOA trainers in the US, Herrera hopes to create one soon. Until then, try this list or search for personal trainers, Pilates teachers, and other movement instructors in your area who are ELDOA student practitioners or certified trainers.